Northwest Film Forum is about to showcase a new 4K restoration of Orson Welles’s Othello, one of the director’s greatest—and rarest—films. In anticipation of that, Parallax View presents a detailed program note written when Othello appeared in an autumn 1971 film series devoted to Welles on the University of Washington campus. The original text remains essentially unaltered, with references to earlier Welles films the series-goers would have seen and, at the outset, one they had not. Welles’s last American film of the Forties was not a happy experience. He had once considered Macbeth for his cinematic debut, remarking in 1940 that “Macbeth and its gloomy moors might be grand” for the movies: “A perfect cross between Wuthering Heights and The Bride of Frankenstein.” But when he came to make the film some seven years later, he was to enjoy nothing like the production resources behind the Goldwyn–Wyler Wuthering Heights; and—save for isolated passages that fairly leap out of the body of the film—he seemed curiously paralyzed, his style grown monotonously murky and overbearingly static, as though he had yet to grasp the full implications of The Lady from Shanghai: little of Macbeth is on a par with its predecessors in the Welles canon or, for that matter, with the extravagant cinematic imagination of James Whale’s Bride of Frankenstein. To be specific on production matters, Welles made Macbeth at Republic Studios, a company that specialized in westerns and action flicks. He had a slightly larger budget than he’d enjoyed on Kane, but his shooting schedule was staggering: a mere 21 days. With an awesome surge of creative energy and organizational genius, he came in on schedule, although he begged in vain for another two days in which to do some retakes. Not the least of the difficulties during shooting was that Welles had pre-recorded the soundtrack and asked the actors to synchronize their on-camera performances with their former readings (a method attempted on The Magnificent Ambersons but abandoned almost immediately). The technique wore heavily on the players and the sound of the dialogue displeased the producers and the first preview audiences: it was delivered with a heavy Scots burr. Actors were called back for re-dubbing some of it in clear English, some in purest American. Welles wasn’t around; he delivered his own new lines from London, and production assistants Richard Wilson and William Alland (Kane’s Thompson, also the Second Murderer here) coordinated the various tracks as best they could. The soundtrack of the present Macbeth includes material from all the endeavors, so that Duncan and (at first) Malcolm are still heard burring away. Small wonder that Welles forsook Hollywood following this experience and began filming on the Continent by hook or crook. The whole film serves as a kind of mirror to Macbeth’s own consciousness. As Citizen Kane leapt back and forth in time, and as The Lady from Shanghai served up a world-sized Crazy House in which Michael O’Hara was perpetually caught at a disadvantage by the shifting, ever-changing camera angles as much as by Elsa’s machinations, so does Macbeth extend Welles’s experiments with a world whose topography and geography puzzles the eye and mind. Macbeth’s castle seems hewn out of the very cliffside, its hallways nothing more than slimy caverns. In one of them Macbeth hears the just-murdered Banquo’s last words to him reiterated again and again, accompanied by and eventually identified with a manic drip drip drip down the wall beside him. When he sees Banquo’s ghost, not only do the other guests fait to see him—they become invisible themselves. Macbeth’s vision grows increasingly solipsistic until the “Tomorrow and tomorrow and tomorrow” speech, delivered while the screen is filled with the roiling white fog of the beginning, a huge black closeup of Macbeth cut in only at the last line. When Birnam Wood comes to Dunsinane and the army of Malcolm and Macduff attacks, a score of camera movements rush breathtakingly inward, penetrating Macbeth’s stronghold and shattering his dream, As the army cheers Malcolm in victory, similar movements retreat out, out, out, until we see the castle as a misty special effect in the distance, the white fog seething round it, and the Three Weird Sisters viewing the completion of their punning prophecy. It is an ending we have seen before, and for all the displeasure given by roughly three-fourths of the picture, it nearly manages to redeem the experience. From the shortest shooting schedule of his career, Welles turned to his longest: Othello was fully four years in the making. Scheduler is a bit of a misnomer since surely few productions have been more chaotic. Micheál MacLiammóir, the film’s Iago and one of the men who gave Welles his first job in the theatre, has written a book about the experience, aptly titled Put Money in Thy Purse. Financing himself by acting in others’ dreadful pictures (The Third Man is of course a conspicuous exception), Welles held his project together with might and main, wearing out several Iagos and Desdemonas, appropriating costumes from one of the other pictures he played in (The Black Rose), transplanting Cyprus in Morocco, driving his cast and crew to film all day, often many takes of the same scene, and partying them all night. It is even said that he persuaded his players to go out and take other jobs, that they might supplement the budget thereby. The credits note the participation of five cameramen, four cutters, two composers. Yet for all this, Othello is a triumphantly unified work, worthy of its self-description: A Motion Picture Adaptation of the Play by William Shakespeare. It is a true translation, a carrying over of Shakespeare’s poem into the poetry of another medium. Time, space, light, shadow, movement have all been reconstituted out of hundreds, perhaps even thousands of inspired image units. It hardly needs to be pointed out that Shakespeare never wrote the pre-title sequence. In truest Wellesian fashion, Othello begins with the funeral of the title character and his bride, and the literal comeuppance of his evil genius. 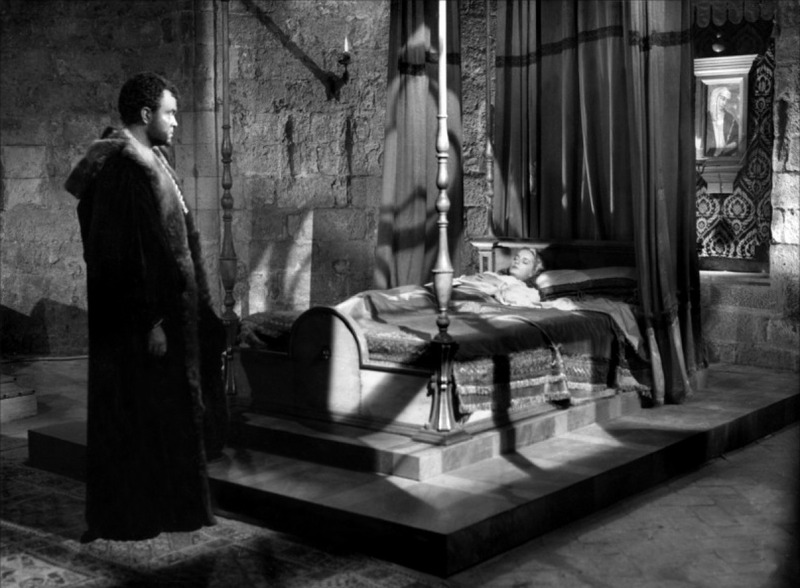 We first see Othello’s huge black head, tilted down-screen almost surreally; the camera cranes up to emphasize his stillness, then descends at once to follow his corpse as it is borne out into the light. Othello’s procession converges with that of Desdemona, and the various lines of pallbearers and mourners continue their parallel marches on their respective planes. Suddenly the stately movement and music are confronted with opposing motion and discordant sound: Iago is being led on a chain toward his punishment. Confined in a cage, he is hoisted high above the funeral scene and observes it in pendulous arcs. The marchers continue, ever in silhouette, and the camera tilts down from such a ceremonial skyline to the utter blackness of a shaded wall, whereupon the titles appear. As with Kane, then, the largest facts are known from the beginning, or at least from the moment Welles’s voice introduces the three main characters and implies the cause-and-effect pattern to come: the effect we have seen, the minutiae of causes remain to be observed. Death, fatality, the absence of any other possible future hang palpably over the film: at one point Othello lies outside the walls of Cyprus stricken with horror at his growing suspicions, his lips frothed, his eyes staring sightlessly at the shrieking birds wheeling overhead as though he were already dead; and he does stab himself earlier in the final scene than the customary directions indicate. But fatality has another name here; as with Charlie Kane, incontestable cause can never be determined. In Lady from Shanghai Elsa tells Michael: “I’m not what you think—I just try to be that way.” He replies: “Keep on trying. You might make it.” In Othello most of all among Welles’s films, the characters are true to their natures and in being true find out what those natures are. And so do we. It is appropriate that Iago enter the main body of the narrative as a near-silhouette overlooking Othello and Desdemona’s flight to their marriage. The shot of him is held long and for most of its duration is seen dissolved over a shimmery lagoon surface; he seems reflected on the very medium of Othello’s mastery. In The Magnificent Ambersons George’s image hovers over the Amberson lawn as Eugene forgoes his last opportunity to see Isabel, but George is only the instrument of Fanny, who is able to sow ideas in his selfish brain and leave him to believe them his own. Here George and Fanny become one in the form of Iago. Yet Othello is not merely a Eugene acted upon and frustrated; he too partakes of George, being the ultimate agent of his own destruction. And Iago and Othello are themselves mirror images of each other, not only in the sense of their specific likenesses, but also in the sense that a mirror shows the reverse of something. Iago announces, “I am not what I am,” yet it is his very nature to be that, to be the deceiver; and when he assures Lodovico of the apparently mad Othello, “He is that he is,” the statement is at once utterly false and utterly true. The Orson Welles role in the film is that of a general with a new bride, yet it is his ensign who exercises greatest directorial potency. Iago stages a shadow play for Othello, placing him where his vision will be circumscribed by a frame and where his hearing will be impaired by echoes as well as the pounding surf and screaming gulls: “Watch Cassio’s gestures,” he directs, and then plays the scene effectively for Othello’s increasingly sympathetic eye. We have already seen that his timing and sense of place are impeccable. The cutting of his conversations with Othello is almost subliminal in the way it links inflections, pauses, reactions, gestures into a fatally organic whole. The camera and Iago discover suggestive details all but simultaneously, as when Iago notices a statue of Madonna and Child overlooking him and his victim, and he crosses himself to reinforce his credibility. Aptly, we cut to a shot that shows not the statue itself but the shadow of the statue as Iago makes the cross. The shadow of Cassio falls in another composition, one with Emilia and Desdemona conversing in foreground and Iago approaching from the rear of the shot to set up a scene for Othello’s watching; he will have Desdemona seen talking with Cassio, and Cassio’s usage here is as innocent for his part as that of the Madonna. It is a film full of shadows and reflections, persuasively vivid yet unreal, surrogate things. The shadow has a long heritage in Western art and thought, and some of its associations are most consistent. In connection with Welles it is relevant to consider not only Shakespeare’s recurrent shadow imagery but also such Welles sources as Conrad, whose Heart of Darkness was the first property Welles actually prepared to film in 1939, with himself cast as both Marlow (to have been a largely offscreen role, with the camera itself representing the character) and Kurtz, and whose stories and novels are full of characters haunted by shadows, memories of past failings or even corporeal doppelgängers. There are also the powerful works of the German Expressionist screen, especially those of Fritz Lang, and most especially M, the main character of which (played by a baby-fat Peter Lorre not unlike the young Welles) was a schizophrenic child-murderer whose other self committed horrible crimes during periods when his daylight self blacked out, and who was frequently shown reflected in mirrors and the dreamworld of shop windows. Charlie Kane had his share of stand-ins in the first Welles film, but here Welles raises the double to a higher level of resonance, probing deeper still into the nature of human nature. 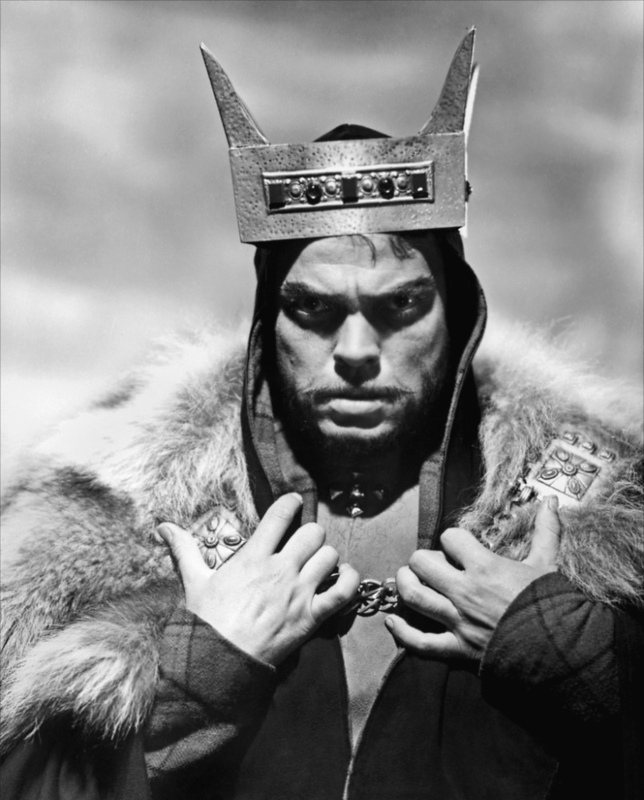 In his Macbeth Welles took a minor character from Shakespeare’s dramatis personae, Seyton, and invested him with more visual importance than the playscript would imply. A grotesque and apparently half-mad dwarf, Seyton functions as a visible sign of Macbeth’s warped identity. Before Macduff’s army attacks, he hangs himself on the bell-rope for no apparent reason other than to foreshadow the imminent demise of his master. 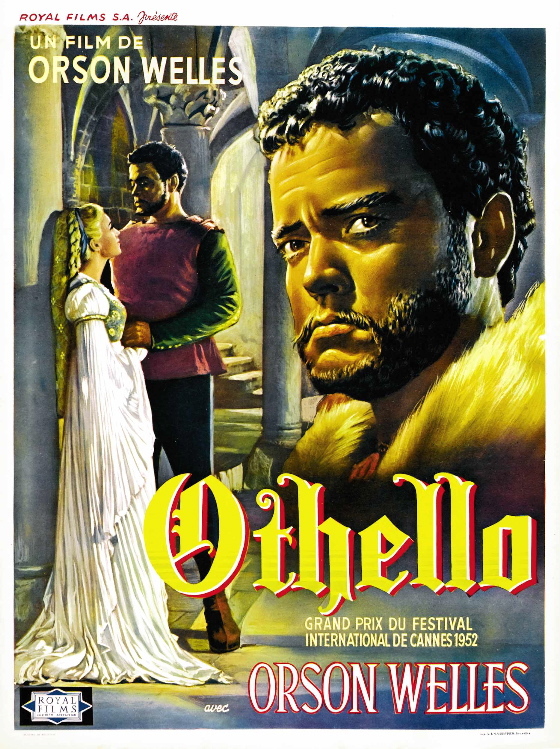 This stylistic figure on Welles’s part further foreshadows not only the end of Iago but his relationship to Othello, who unwittingly puns when expressing his gratitude for Iago’s “truth”: “I am bound to thee forever.” The rapid intercutting that juxtaposes the hectoring Iago and the harried Moor in so many sequences ultimately tends to join and equate them. 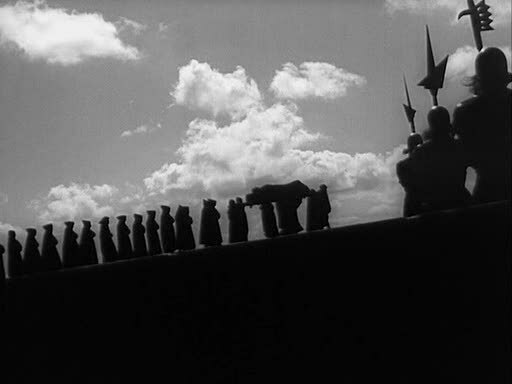 In one remarkable sequence Iago all but pursues Othello into a dark alcove where, as Iago yammers offscreen, Othello cowers under a misshapen carved statue; the statue at once reflects his obsequious position and Iago’s ascendancy over him, just as—taking the logic the other way round—Elsa in Lady from Shanghai is both bird and serpent, Grisby both macaw and crocodile. Othello next moves to study himself in a mirror—a black mirror, it seems—and a startling composition gives us Iago in screen left and Othello at right, in the mirror, both of them staring fixedly in apparently the same direction. A moment later Othello sees Desdemona in this mirror, the mirror of the vision Iago has taken over, and she is distorted. Striking instances of this sort of thing abound: Othello’s shadow rushing along a wall, his body coming into frame and hurling against the shadow: Iago dashing up as if in pursuit; Othello looking back as if from concealment and demanding, “Dost thou mock me?”—shadows on shadows. Or there is the remarkable passage when Desdemona walks across the patterned courtyard as if resigned to her fate: we are looking down at a precipitous angle, as of Iago and Othello on the cliffs, and the camera rushes into a dark corner to discover the watcher, Othello; he sees Iago approaching—his shadow advancing before—and it is as if his own dark thought had been recognized: he calls for poison. There was in Citizen Kane a great sense of Kane’s running through the same patterns again and again, setting up a dreamworld and watching it crumble and then setting up another on at once a bigger and smaller scale (Kane ends by building Xanadu, a whole world of his own—but it is after all only Xanadu, a few square miles on a peninsula of a nation that has all but rejected him). Welles imbues Iago’s actions with much the same kind of desperation. Iago can be played as a Mephistophelian figure, but this Iago is less the Devil than a devil, doing evil not for the love of Evil but out of seething personal necessity. Even more than Grisby in Lady from Shanghai, Iago partakes of a searingly homosexual energy. Characterizing him thus lends even more intensity to the concept of character and film: Iago begins by announcing, “I hate the Moor,” yet he must frequently protest his love for Othello and at base does express love in the form of a kind of cosmic envy: he destroys what he wishes he were, and in the process destroys himself. There is a stunning series of shots as he ends speaking with the lisping Roderigo, promising to turn Desdemona’s “virtue into pitch; / and out of her own goodness make the net / That shall enmesh them all.” Thus saying, Iago steps out of closeup. We cut to a quick shot of Roderigo looking after him as he, Iago, disappears from our view past the corner of a building. Most characteristic here: visually one of Iago’s primary devices is to drop a verbal bomb and then step out of the shot while someone else remains to catch the explosion. But we cut in turn to a shot of Iago striding down an alley, and far above hangs the cage that will contain him eventually, fulfilling his prophecy to the letter like those of the Weird Sisters in Macbeth. As we watch Kane destroy himself over and over, so ultimately do we observe Iago’s passionate self-destruction. Speaking of Roderigo, we ought to note that Welles has done a very odd thing. The actor in the role is not one of Welles’s physically right but vocally incompetent Europeans who would automatically require dubbing into English by another voice (it is Robert Coote, whom you may know variously as Sgt. Higginbottom of Gunga Din, Col. Pickering of the Broadway My Fair Lady, or the most watchable member of The Rogues, a defunct TV series of several years back), yet Welles himself has dubbed Roderigo’s lines. Perhaps there was some practical explanation (Coote was not available for re-recording, he and Welles quarreled, etc.). As things stand, it is interesting to consider that Roderigo is the other character, besides Othello, given to self-perusal in mirrors and seeded with ideas by Iago. He even has an additional double or at least familiar in the form of his poodle. His death is suiting, stabbed at under the ftoorboards like a dog fit only for abuse (interestingly, Iago’s omnipresent sword is matted into the shot so that it can appear to pierce where there is no opening to admit it). All the deaths in Othello are fitting. Othello completes the task of destroying Othello; Iago, who climbed higher in power and stature, holds dominion over a cage. And Desdemona, save for her last frantic pleas for life, dutifully submits to her husband’s will. Lying on the bridal bed, she is photographed in the same position in which we see Othello’s corpse at the beginning of the picture; Othello looms as a shadow on her bed-curtain, yanking this aside to deflower her. He will similarly yank the curtains asunder (in Cyprus) after he has seen Desdemona distorted in the mirror and laid his hands, like a strangler’s, about her throat. The last instance occurs on the night of her murder. Desdemona accepts her lot at her lord and master’s hands and dies in one of the cinema’s first freeze-frames. In Lady from Shanghai Michael O’Hara observes, “It’s a bright guilty world”; he might be describing the landscape of susceptibility in Othello, where the strong Mediterranean sun casts the deepest shadows and true recognition is difficult. The world of Othello is always apt and expressive. When Roderigo forces Cassio to fight, a quick succession of shots sweeps us into a location so bizarre—a columned hall lying ankle-deep in water—that we are fully as disoriented as Cassio is surprised and Roderigo terrified at his ordered rote; the coup de grace is administered when we just have time to realize Cassio’s companions are watching the duel from a skylight when their reflection is dashed into incoherency: for it was a reflection, and in water. Plied more and more by Iago, Othello increasingly tends to be seen through slats, rafters, pillars; and a series of fluid dollies among the columns of the palace serves to keep Othello and Desdemona separate, distanced by his growing doubt. Iago plays with aspects of reality as though they were stage properties (the Madonna) or special effects (the screaming gulls, the surf) and he, Othello, and a nearby building are all tilted at one frantic moment. But eventually Othello’s solipsism supersedes even his. Mortally wounded, Othello lurches around the conjugal chambers, and the camera, shooting straight up at the ceiling, is fixed on him, so that his dying form is absolute while the world skitters all awry, For his final speech the rest of the world is shut away entirely, only Othello’s earnest upturned face visible on a black screen. The lengthiest cataloguing of Welles’s inspired poetic achievements would still leave Othello incompletely described and inadequately appreciated. He has never given us more or more-splendid images than here. The music of Lavagnino and Barberis is inseparable from the shape and flux of his action, especially in the scenes of the flagship’s arrival at Cyprus. But time and again the single vision behind the film is clearly Welles’s and none other. As Lodovico’s ship puts into port, 0thello delivers the “Farewell the tranquil mind” speech, and as he completes it, the ship closes darkly against the pier, its poetic meaning unobtrusively grown complete. It is fitting that his Othello should also stand as one of the several most deeply felt performances of his career. It is a tribute to his integrity as a director that MacLiammóir’s Iago surpasses his own performance thanks to the complex design that gives Iago the film as surely as Ambersons is claimed by Agnes Moorehead.